Fourth Years… The Force is With You! As August begins fourth year medical students begin a seven month odyssey of anxiety, self-promotion and self-doubt. That’s right, they’re beginning their Match journey. It was incredibly frustrating as a student on rotations trying to compile information and keep calendars straight. There are so many resources and you’re so excited you might puke! But don’t worry, I made you a list. Actually, I made you three lists. Sometimes I go overboard. I currently do not recommend the AAFP app because it is slow and the interface is frustrating. To get to residency info you have to find the “For Students” section and then page through individual residency pages. It’s not ideal, but your mileage may vary. ERAS FAQ – everyone uses ERAS. This is the last year of the AOA Match, due to the single GME accreditation transiton. I Matched in 2016 and chose to go through the ACGME Match, like 50% of 2018’s osteopathic graduates. This may be the best option for you, as 2020 is the deadline for transition. I don’t know what is in place for residents in a program that fails to complete ACGME accreditation by the 2020 deadline, but I’d be concerned about the risk of graduating from a program that doesn’t exist after you finish. February 4th – AOA Match email tells you if you matched and where. The Scramble begins at 1200 ET. March 11th – ACGME Initial Email tells you if you Matched, but not where. SOAP begins at 1100 ET. March 14th – SOAP ends. March 15th – ACGME Match Day, when MD schools have Match parties at 1200 ET and torture their students with the “reveal” of where they Matched on stages. That’s the list. 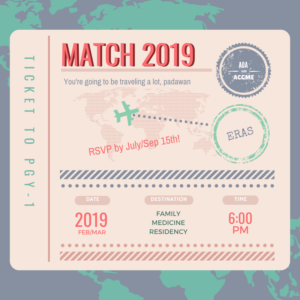 The journey ahead is so exciting and awesome, and at the end YOU are going to MATCH into an AWESOME Family Medicine Residency. I’m so proud of you!